I’ve been slacking off posts because of an overwhelming amount of source material. I realize that doesn’t make sense, but “overwhelming” is the key word in that sentence. 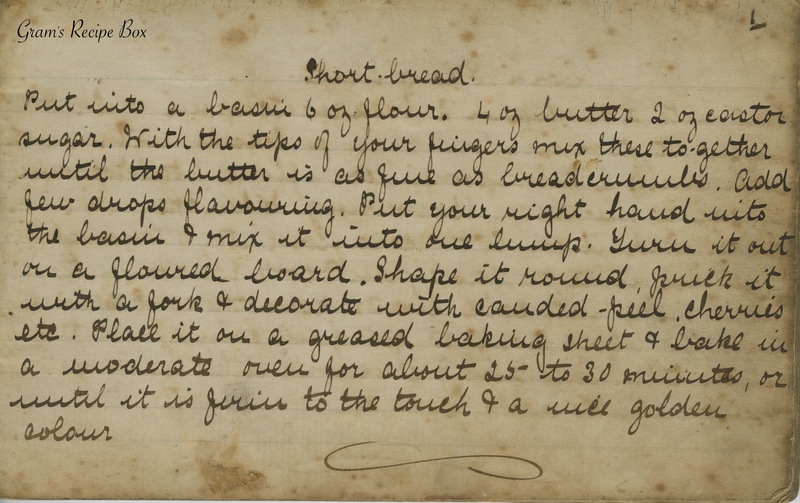 Recently, I have collected well into the hundreds of vintage and heirloom handwritten recipes! I found a little box very similar to my Gram’s recipe box (the one that started this whole thing!) at a local antique shop and lo and behold it was packed to the gills with recipes! Then, I found an old notebook, every page filled with handwritten recipes and then a few pages having cuttings glued in. On ebay I found a packet of 35 handwritten recipe cards, and a fabulous old book from the 20s that is just falling to pieces, but has wonderful heirloom recipes, menus and entertaining notes written on nearly every page. My final treasure is a 19th century pamphlet, handwritten by Ms. Maggie S. Ritchey, Class V Senior, from Edinburgh, Scotland. It was tough to decide where to start, and that fueled my hemming and hawing. Finally I decided to begin at the beginning, so to speak, and work with the oldest set of recipes. I believe the booklet might be from an home economics or basic cooking course for girls. There is an index in the back and each page is numbered. The variety of dishes range from soup to basic dinner entrees to desserts, with 30 recipes over 42 pages. The handwriting is graceful and oh so nostalgic. I will present this book to you in the order it is written, so without further delay we have item number one: short bread. Put into a basin 6 oz flour, 4 oz butter 2 oz castor* sugar. With the tips of your fingers mix these together until the butter is as fine as breadcrumbs. Add few drops flavouring. Put your right hand into the basin & mix it into one lump. Turn it out on a floured board. Shape it round, prick it with a fork & decorate with candied peel, cherries etc. Place it on a greased baking sheet & bake in a moderate oven for about 25 to 30 minutes, or until it is firm to the touch & a nice golden colour. * castor sugar is white granulated sugar that has been ground again so it is more fine than standard white granulated sugar. It is not as fine as powdered sugar. I think I’ll be trying this one!